Postcard US-3064227 from Pennsylvania shows traditional Amish buggies in Pennsylvania. According to Wikipedia, "the Amish are a group of traditionalist Christian church fellowships, closely related to but distinct from Mennonite churches, with whom they share Swiss Anabaptist origins. 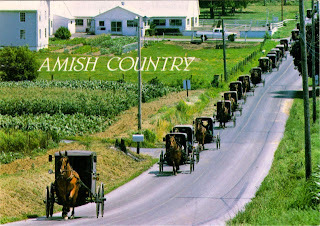 The Amish are known for simple living, plain dress, and reluctance to adopt many conveniences of modern technology."